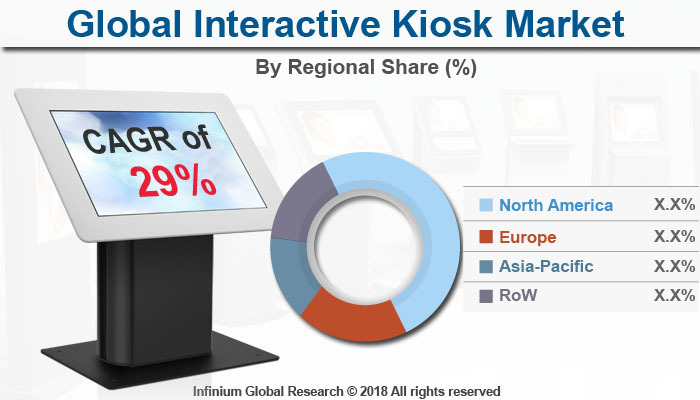 A recent report published by Infinium Global Research on the interactive kiosk market provides in-depth analysis of segments and sub-segments in global as well as regional interactive kiosk market. The study also highlights the impact of drivers, restraints and macro indicators on the global and regional interactive kiosk market over the short term as well as long term. The report is a comprehensive presentation of trends, forecast and dollar values of global interactive kiosk market. According to the report, the global interactive kiosk market is projected to grow at a CAGR of 29% over the forecast period of 2018-2024. An interactive kiosk is a computer terminal featured with particular hardware and software that provides information, communication, and knowledge. An interactive kiosk is used for education, ticketing and commerce, and entertainment. Advancement in technology has resulted in the development of kiosk and it is performing a broad range of functions such as show directions on map and bill payment. It has also added some customized components such as bill acceptor, card reader and thermal printers to perform the customized task. Growing use of interactive kiosk helps people avoiding queues at the several service intensive places such as banks in making deposits & withdrawal, railways ticketing, and bill payments. Further, their applications at the airport for check-in and filling the immigration form, hospital, and governmental organization to keep records for the visitor are some of the factors driving the growth of the market. However, rising smartphone and tablet creation may make the use of interactive kiosk out of work, and this hampers the market growth. Among geographies, North America is anticipated to hold the largest share in the interactive kiosk market. Factors driving the North America region for interactive kiosk market are owing to the strong economic conditions and high customer adoption rates. Further, growing demand for the general vending machine, growing use of kiosk at airports, a checkout counter in several stores such as Wal-Mart are also driving the growth of the market. In addition, the Asia Pacific market may also witness growth due to faster adoption of kiosk technology in a high ends service industry such as railways, retail industry, airports, and healthcare. The report on global interactive kiosk market covers segments such as components, types, and end-users. On the basis of components, the global interactive kiosk market is categorized into hardware and software. On the basis of types, the global interactive kiosk market is categorized into vending machines, photo counters, check-in, coin, and currency counters and items. On the basis of end-users, the global interactive kiosk market is categorized into hospitality, government, entertainment, and transportation. The report provides profiles of the companies in the global interactive kiosk market such as KIOSK Information Systems, SlabbKiosks, Embross, Meridian, Advantech Co., Ltd., KAL, NCR Corporation, Source Technologies, Diebold Nixdorf, Incorporated and REDYREF. The report provides deep insights into demand forecasts, market trends, and micro and macro indicators. In addition, this report provides insights into the factors that are driving and restraining the global interactive kiosk market. Moreover, IGR-Growth Matrix analysis given in the report brings an insight into the investment areas that existing or new market players can consider. The report provides insights into the market using analytical tools such as Porter's five forces analysis and DRO analysis of the interactive kiosk market. Moreover, the study highlights current market trends and provides forecast from 2018-2024. We also have highlighted future trends in the interactive kiosk market that will impact the demand during the forecast period. Moreover, the competitive analysis given in each regional market brings an insight into the market share of the leading players. This report will help manufacturers, suppliers, and distributors of the interactive kiosk market to understand the present and future trends in this market and formulate their strategies accordingly.